Apache Junction is a desert community at an elevation 2,070 feet above sea level as the easternmost community in the Phoenix-Mesa metropolitan area, and home to the legendary Superstition Mountains and the gateway to a wonderful outdoor recreational area. With a hometown feel, Apache Junction continues to value and respect the natural environment, with lifestyles and activities everyone can enjoy. The area is fast becoming a popular destination for families, vacationers and business. Surrounded by every natural beauty the southwest can offer, Apache Junction is a growing city with an exciting historic past. Close to it all, but far enough away from the hustle and bustle, Apache Junction still has the wide open spaces that people come west to find. With all the amenities one may need either found locally or very close by, the Apache Junction area is an inviting oasis in the stress-filled environment of today. Apache Creek Golf Club opened on November 23, 1994. In this short time, it has become quite popular with golfers Valley-wide. In the 1890s, Goldfield was a booming community. The first gold-strike was made in 1892, and it took just a little under a year before the town came to life. One rich strike after another supported the town and approximately 4000 people who lived in the district for five rich years. 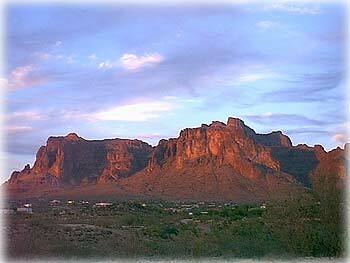 "Sunset Route Limited & Apache Trail Auto Tours"